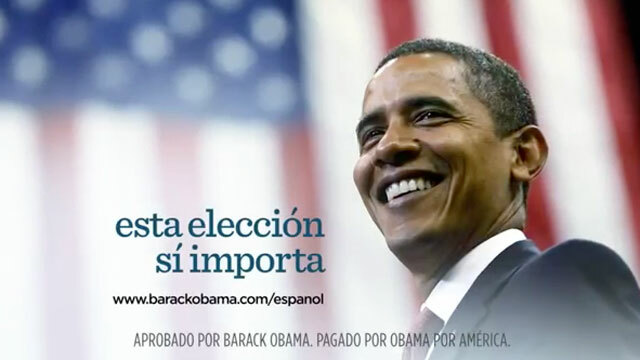 Democrats spent more on Spanish-language ads than Republicans in the 2012 presidential race. President Barack Obama and Republican challenger Mitt Romney attempted to garner votes from the Latino community in a lot of colorful ways. Although Hispanics have said they prefer Obama's policies on immigration, such as the deferred action program, the Obama camp did also spend more money targeting Latinos, specifically Spanish-speaking Latinos. Political spending on Spanish-language advertisements in the presidential campaign was slightly more than 6.2 percent, or $22.8 million, of the total, according to a new report by the United States Hispanic Chamber of Commerce that looked at spending in 10 states using data from Kantar Media's CMAG, a group that tracks campaign media buys. Total spending in the states studied was $355.2 million. The study focused on Arizona, California, Colorado, Florida, Illinois, New Mexico, Nevada, Texas and Virginia, states with significant Latino populations. Most of the Spanish-language ad money was spent in the swing states of Colorado, Nevada and Florida, specifically in Denver, Las Vegas, Miami, Orlando and Tampa. Democrats spent $12.4 million on more than 15,000 Spanish-language ads compared with the $9.7 million Republicans spent on more than 8,500 ads. While Democrats ran most of their Spanish-language ads in Denver, followed by Orlando and Las Vegas, Republicans targeted Las Vegas, followed by Orlando and Denver. Democrats ran nearly 5,000 ads in Denver, their top location, while Republicans ran just shy of 3,000 ads in their top city, Las Vegas. "From the beginning it was clear Hispanic voters would play a pivotal role this election…Yet neither party seems to have fully gotten the message. Investment in Spanish-language advertising is a mere fraction of what it should be. Campaigns aren't effectively communicating with the Hispanic community," Javier Palomarez, President and CEO of the USHCC, said in a statement. "One cannot help but feel that both parties have a good deal of work to do if they hope to keep up with America's fastest-growing population." Latinos comprised a record 10 percent of voters in the 2012 election, exercising significant influence in swing states such as Florida and Colorado. And while the power of Spanish-language advertising is unclear, many see the ads as a way of reaching out to Hispanic voters. "There is no 'right' level of Spanish-language advertising," Palomarez concluded. "But certainly both major parties should be prioritizing Hispanic voters in election cycles to come."